My last article on clutch inspection focused on rough engagement, and how to fix it to get by for a few more motos. In this article, I will be focusing on clutch inspection and repair for a clutch that slips, or only has partial or no engagement. I always recommend that you seek out professional help if you are either uncomfortable doing the work yourself, or you experience issues beyond the scope of this article. This is a clutch problem that I’m sure most riders have encountered at one point or another. In the first installment of ‘Clutch Inspections’ I touched on stiff or rough engagement. But what if you are experiencing a different problem such as lacking engagement or forward drive all together? This problem is usually a symptom of a worn or deformed clutch. The clutch assembly in your bike is most likely a wet multi-plate system consisting of friction plates, steel divider plates as well as a pressure plate, hub and basket. To simplify – an outside plate that is linked to your clutch lever is actuated by a push rod that either removes the pressure plate from the clutches or allows spring pressure to hold the friction plates and steels discs together. When the lever is released the clutch springs press the plates together which intern connects the motor to the transmission, which allows it to turn under acceleration. Alternatively when the clutch lever is pulled in, the push rod pushes against the pressure plate and springs to allow the friction discs to float freely and transmission drive is released. As we all know the clutch is a highly wearable part of the bike and can leave you sitting on the side of the track unless you spot the early signs of clutch failure. As the friction plates start to loose their facing material, the space between each steel disk and friction disc increases, thus making it harder for the springs and pressure plate to keep everything engaged while driving forward. This extra space will also increase the temperature developed in the clutch resulting in a ‘fading’ type feeling when feathering through the corners. 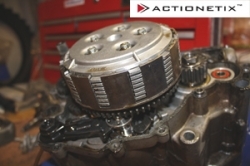 Early signs of a worn clutch usually start with difficulty shifting while riding. This will eventually progress into a harsh first gear engagement or if you do get it into gear, the bike will surge forward and provide forward drive even with the clutch lever pulled completely in. As a temporary measure clutch cable adjustment may be necessary to give the clutch lever the most pull, so that the friction plates will let go of the transmission. If the bike is equipped with a cable clutch, cable tension can first be modified at the barrel thumb wheel on the perch the secondly at the adjuster located where the cable enters the clutch case on the engine. Doing this will remove any cable free play and may get you by for the day. However the inevitable repair to fix the issue, will be clutch replacement. A hydraulic clutch like the KTM is self-adjusting and will continue to provide pressure via a master cylinder to the pressure plate until the clutch is completely worn out. At this time it needs to be replaced (You should inspect your clutch from time to time before this). A secondary symptom which is usually a bi-product of warn out friction plates is intermittent slippage or unpredictable (jumpy) drive when under hard acceleration. The steel plates that separate the friction discs can also become too thin or warped because of excess heat and wear. These thin or warped discs may cause strong engagement in some cases, or they can slip and produce almost no drive in others. Again, this is the time to replace your clutch. Warn out clutches are potentially dangerous because they can contribute to shorting jumps, incomplete passes and missing obstacles – and we all know how that can end up. A healthy driveline is one of the biggest keys to a bikes performance and should always be serviced and replaced with the best you can afford, after all with a bad clutch the is no ‘driving force’.